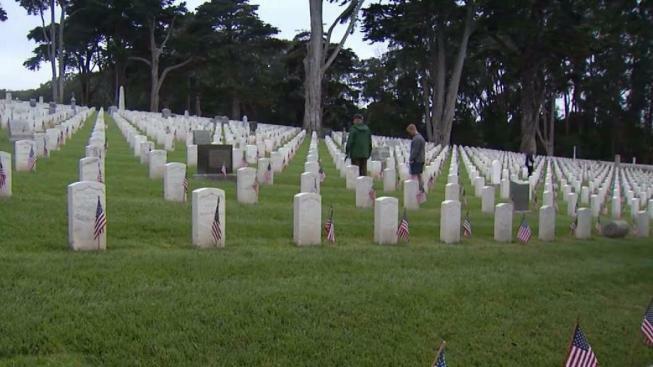 Hundreds of people gathered Monday at The Presdio in San Francisco for the cemetery’s 149th observance of Memorial Day. One of the fallen soldiers remembered during the ceremony was 21-year-old Army Pfc. Caesar Viglienzone, of Santa Rosa, who died in Iraq in 2006, the victim of a roadside bomb. At the podium Monday to honor Viglienzone was retired general and former ambassador to Afghanistan Karl Eikenberry. Eikenberry said he wanted to tell a personal story of Viglienzone, and in doing so, he talked about the young man’s love for abalone diving with his dad. "He would climb every tree he could find. He loved the ocean," Eikenberry said. "He did his best to schedule his two week R&R for April 2006, the start of the abalone diving season." But before Viglienzone could get home, he and two other soldiers were killed when their Humvee was blown up. Viglienzone’s parents found out a month ago that Eikenberry wanted to publicly honor their son. "To have words spoken by people who have serviced, and then just to have citizens here; it’s meaningful," Dennis Viglienzone said. Norma Viglienzone said her son was a rough-and-tumble little boy who grew up to love adventure. "The fact that he’s a retired general made it just that much more special," she said of Eikenberry's speech. Viglienzone’s parents said they were proud of their son. "As tough as it has been, what we do, we do for him," Dennis Viglienzone said.